Desert Island Discs: “Track Record” by Joan Armatrading (1983) | Name-Brand Ketchup. Oh look, it’s another greatest-hits disc. In the mid 80s, a good friend often played this album at her home. She recorded a cassette copy for me, which I played till it wore out, then I bought two more commercial cassettes and loaned them out and never got them back, and finally bought it on CD. This album is that good. Joan Armatrading was born on the Caribbean island of St Kitts and grew up in London. Self-taught on guitar and piano, she started playing gigs around Birmingham at age 16 and eventually joined a cast performing “Hair.” Joan released an album on an indie label in 1972, but due to lack of promotion it went nowhere. In 1975 she switched to A&M, where she had her biggest successes and stayed till 1995. “Track Record” is a compilation made up of songs from her first albums and an EP. UMG has since released more compilation discs but to me this is the one that sounds right. Joan only ever had one single in the Billboard Top 100: “Drop The Pilot,” which reached #76 in 1983. Probably her best-known song is 1981’s “The Weakness In Me,” which has been featured in several movies and covered by a few other artists. My favorite songs on the album (and it’s hard to pick) are “Down To Zero” and “Love And Affection,” both from 1976. But, again, every song on this album is remarkable. 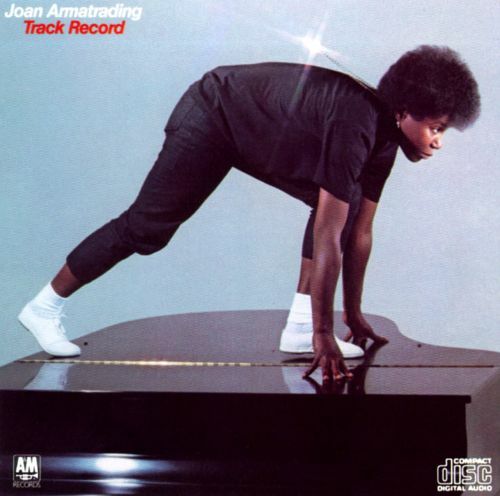 I still am amazed that Joan Armatrading is not a huge star. But those who know, know. Check it out.